In this article we will learn How to Get Nth Max salary and also how to get Max salary and get second highest salary from a table. In previous articles we have learnt What is CTE in SQL and use , Stuff and Replace in SQl. 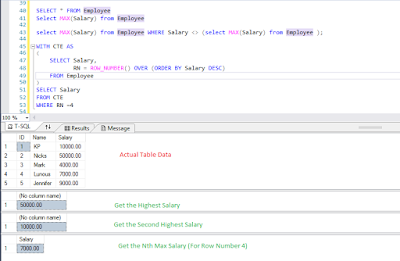 Temp table and table variable .Group By in SQL Server and its use. If Else and Case statement , While Loop . What is Cursor in sql and use of cursor. Difference between Row_Number(), Rank(), Rank_Density() with example. We already learnt how to use CTE and CTE examples in Previous update. 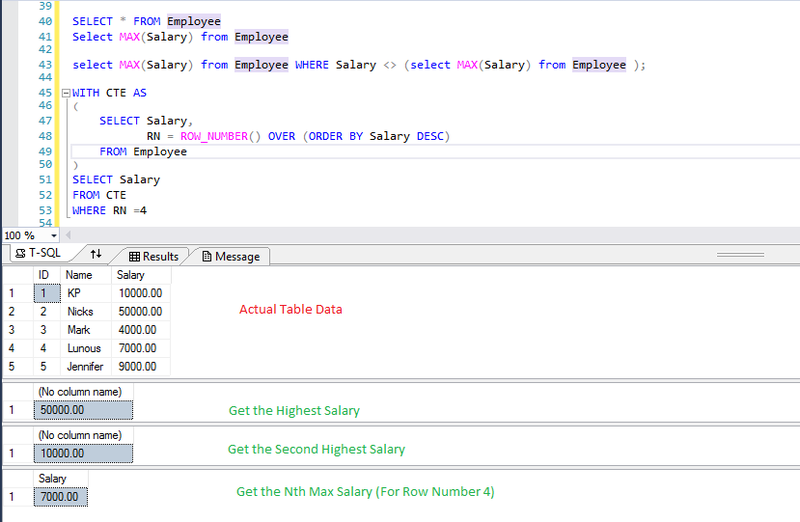 here we use the same CTE to get the Nth max salary from a table using Row_Number() function. This is ROW_NUMBER() function which returns a unique number of each row. If you have 15 records then it will return number start from 1 To 15 in RN column. This line only arrange the salary in descending order and also applied the row number for each row. 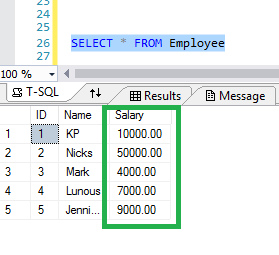 Suppose if Someone ask you to get 10th Highest salary then using above explained query you can get the 10th Highest salary.